One 4 oz. Smooth as Silk glides on smooth as silk and has 1½ oz. more deodorant than the National 2.65 oz. brands! Invisible solid deodorant goes on clean with no white streaks or residue and is made with the highest quality organic ingredients and pure essential oils known for their anti-bacterial, antiseptic, anti-fungal, and antimicrobial properties; fighting odor causing bacteria while absorbing and neutralizing wetness, keeping you smelling fresh and clean all day long. Perspiration is the body’s natural way of ridding toxins from your system. What Zen a Lotion Bar Organic Deodorant is made of all natural ingredients which means it’s free of aluminum, parabens, sulfates, GMO’s and there’s no gritty baking soda to irritate delicate underarm skin so you feel fresh without applying harsh chemicals or abrasives to your body. The cause of perspiration and body odor stems from your body’s temperature regulation system, specifically your sweat glands. When your body temperature rises, your autonomic nervous system stimulates the glands causing the cells surrounding them to contract and secrete fluid onto the surface of your skin, where it cools and hydrates your body as it evaporates. This fluid (perspiration) is composed mainly of water and salt (sodium chloride) and contains trace amounts of electrolytes and substances helping to regulate the balance of fluids in your body, however these secretions also causes bacterial growth which pass off as the sour odor of perspiration. Something to keep in mind, when you first start out using natural deodorant the first few weeks after you kick the chemical, carcinogen deodorant habit, you may sweat more but they will dry out over time as your body adjusts to being able to sweat naturally. This is because your body is unclogging its pores and detoxing from the aluminum and other harmful chemicals, so, don’t freak out if you sweat a lot in the first couple weeks… that’s the sign your body is detoxing and getting back to its normal function. Since perspiration is the body’s natural way of ridding toxins in the body, preventing it is not a good idea. 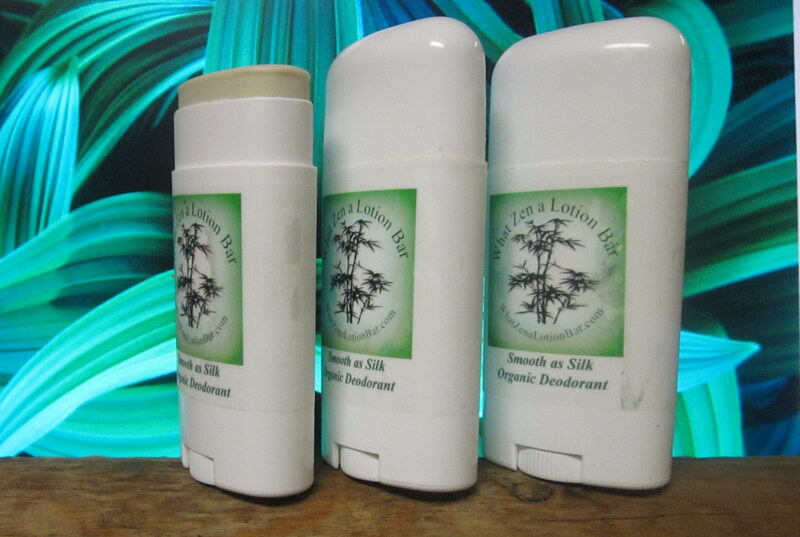 What Zen a Lotion Bar Organic Deodorant is a deodorant only, and will not block your body from perspiring. It does however provide some absorbing properties but will primarily control the bacteria that cause body odor for all perspiration levels. For best results rub the deodorant in and it is recommended to use daily 3-4 weeks to get your body fully accustomed to a chemical free deodorant. *** FACTS ABOUT ANTI-PERSPIRANTS and WHY YOU SHOULD MAKE THE SWITCH! *** Your under arm area is also where some of your Lymph Glands are located. The Lymph Glands are very important for filtering impurities from your system. Antiperspirants plug up your sweat glands. *** Antiperspirants are classified as drugs and cause odor causing proteins to mechanically block sweat ducts. The metal salts found in antiperspirants alter the ducts then close and form a “plug”. The main active ingredients in modern antiperspirants are aluminum chloride, aluminum chlorohydrate, aluminum zirconium chlorohydrate, and buffered aluminum sulfate. *** Antiperspirants use micronized Aluminum clogging your sweat glands preventing them from sweating. Micronized Aluminum has been suspected of causing cancer. Aluminum does occur naturally in the world as a common mineral, BUT is not safe to have lodged in your pores! 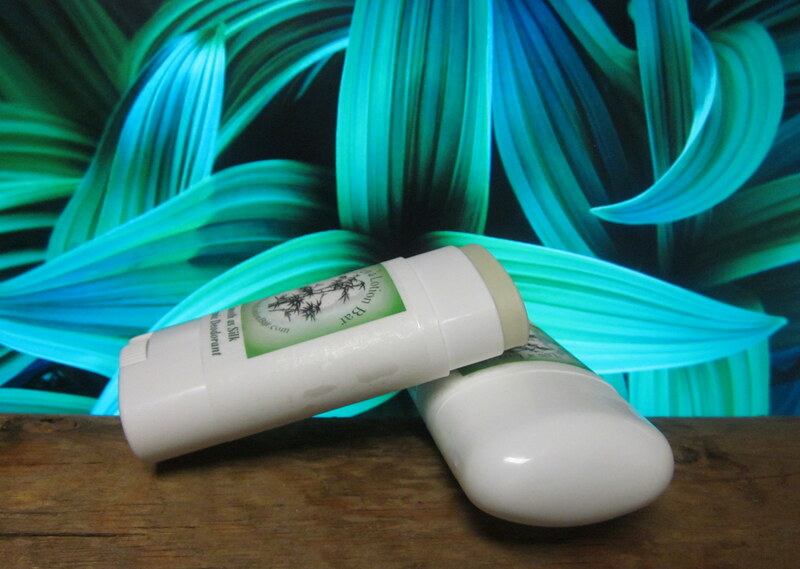 CUSTOM DEODORANT FRAGRANCES ORDERS WELCOME and require a minimum order of three.